This summer I took my Seawind II from the Chesapeake Bay to Bermuda, and then to Antigua. Cruised the Leewards and Virgins, then singlehanded back to Bermuda, picked up a girlfriend and returned from there. About 3800 miles in all, using an Autohelm 4000 wheel pilot. The unit steers great, but it turns out that the internal belt must be replaced every 400 hours. We hand steered the last day into Antigua as the manual doesn't mention this... so we didn't have a spare belt aboard. A new belt fixed things but the unit developed other ills so I bought a complete second unit and had it sent to me in St Thomas. This steered fine all the way back, but also wound up getting a belt replacement. I sent both units back to Autohelm (Raytheon, now). The new one developed a problem where the engagement clutch lever would turn itself to the disconnected position. They adjusted this for free. The older unit had those problems. Overall I'm pretty happy with the units, but think having a spare is mandatory. And, even with two units and a drawful of spare belts I wonder how they'd hold up for a very long trip; hence my interest in the wind vane. The other advantage of the vane is reduced power consumption. My Autohelm eats about 24 amp-hours per day. At sea I burn a total of 75 ah/day (no refrig; just an icebox - two 50# blocks of ice like you can get in Bermuda last 7 days); removing the autopilot means that a couple of solar panels could more or less eliminate running the engine for battery charging. I do also have a CPT auto-pilot, which was an almost unendurable headache for two years. Finally, after the third return, and after Scanmar bought the company, I received an entirely new control head and compass. It's a powerful, efficient piece of gear and it would be a joy to have it actually working! I'll know in another couple of weeks, when we finally get in the water. Meanwhile, I'm thinking once again of solar panels. Perhaps you'd also be interested in this year's wind vane experiences. My round trip from Baltimore to Bermuda to TCI and back covered 3000 ocean miles in June and July so was a good shake down. Some background: Voyager came with an Autohelm 4000. 3 yrs ago I sailed with this from Baltimore to Bermuda and then to Antigua. The 4000 barely made it. I had a girlfriend who visited bring in a new 4000. Now after about 8000 miles with two of these I think they are junk. First, the belt must be replaced often - about once a week at sea. $55 each at West Marine. But once you do that the unit is never the same. The engagement lever will flip itself to the unengaged position. I use shock cord to keep it engaged, but that's one more annoying thing to do whenever turning the A/P on. Second, the unit has about 6 wheels inside that keep the two halves together. These break off. Glue works for a while. I finally thru-bolted these on with #10 bolts, and the units work much, much better and more reliably. But.... two 4000s are good for one summer (3000 miles) of sailing. Then both need to be rebuilt. Anyway, I looked at putting a Monitor on but wasn't too thrilled with running lines all over the cockpit. I found an old 601 Sailomat at Ocean Outfitters in Annapolis (a marine junk shop - a must-visit for people near Maryland) for $250. The unit's main shaft was seized and it had a number of other problems. This is the older design, not made anymore, that uses a servo-pendulum oar to control its own external rudder. 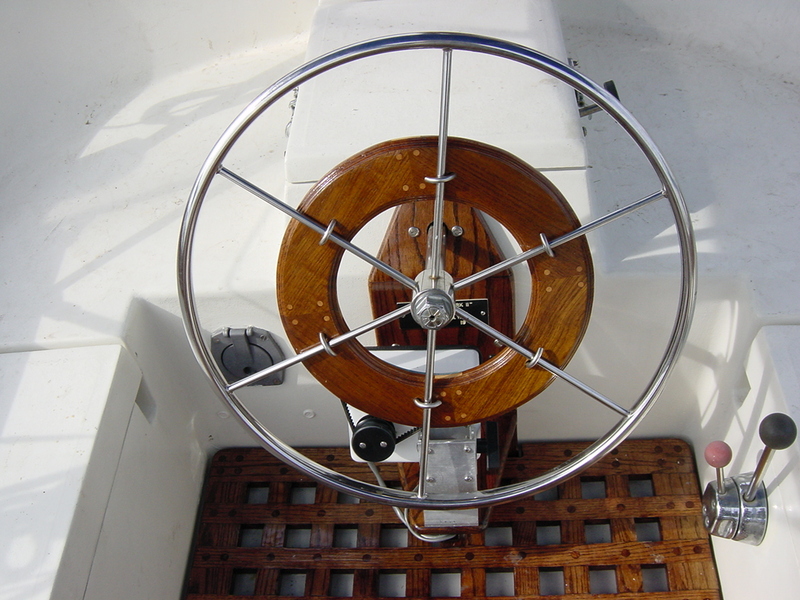 There is no connection to the wheel, and if you lost your main rudder, can still steer with this. A 50 ton press at a machine shop freed the main shaft. Much other work was required to rebuild the thing. However, it's works perfectly. Better than imagined. With the 4000s I run the boat slow - never more than 6 knots as they can't handle things much faster. With the vane the faster the boat goes the happier she it. I came on deck one morning and found us doing 8 knots through the water. At first I was alarmed and started to reduce sail... but then realized she was happy as a clam, steering fine, no water on deck, nothing really out of control. I went back to bed. The vane does follow the wind, so requires attention out of the trades. 10 degree windshifts are too little for me to sense but the unit does, so the course will change. And it does not work when there's no wind and you're powering. So an autopilot is still essential. Still, I'm totally thrilled with the unit. It's hanging on the stern, like most are. It's a strong point, though, so the kids can use it for a handhold when climbing up the ladder. Glad to see you're happy with the sail-omat! I frequently inform friends that the two best items I've ever purchased are the Monitor steering vane and my radar. The Monitor saved our lives one in a Gulf of Mexico storm that forced us to retreat to the safety of the cabin for over 14 hours with water coming over the decks in volumes. A vessel west of us maydayed and was rescued by a ship but gave up their vessel. The Monitor steered the entire time as the winds just screemed in the rigging. The weather boys called it a "bomb" which is a nice term for 24 hour Gale or Storm condition. Our autopilot is a CPT which was purchased by the people who make the Monitor. We have two units aboard in case one fails but now after using it for some 10 years have been happy with it in settled conditions. If the winds blowing over 8 knots the Monitor takes over and in strong winds only the Monitor can really do the job, I'm of the opinion that autopilots are not up to the job in the really rough stuff. Would anyone care to comment? My experience with auto pilots as a delivery skipper must be considered expansive but I have found one consistent winner. Choosing units rated well beyond the displacement is key. The full-keeled and large rudder boats exert far more wave pressure against the linear drive than the fin-keeled boats. I blew several Autohelm tiller units up on my Southern Cross and was very disappointed. However I have great respect for the new line of Raytheon (ex AutoHelm) linear drive units. Their unit tested extremely well aboard my buddy's Hans Christian 43. He runs an 8000 since 1991 and has had no problems at all. My choice for Sea Quill this year was the Raytheon 5000 ST based on the service of the one mentioned and several I have used aboard deliveries. The installation requires some imaginative and robust bracing to fit and the overall cost between the unit and the Edson 10" tiller arm is $3,000 but my confidence level is extremely high. I mounted the control head for the pilot is mounted to the mizzen, (harness hidden with the mast), just between the folding cockpit table and below the mizzen gooseneck (raised eight inches for headroom). You can install a low cost, low-amp Autohelm 1000+ inside the lazarette attached to the Cape Horn actuator which will do the work of a 5000+ at 1/10th of the cost and the amps. As a main autopilot, or a back up of an existing autopilot (cruisers always groan about their autopilot's reliability and need for back up...), this is hard to beat. 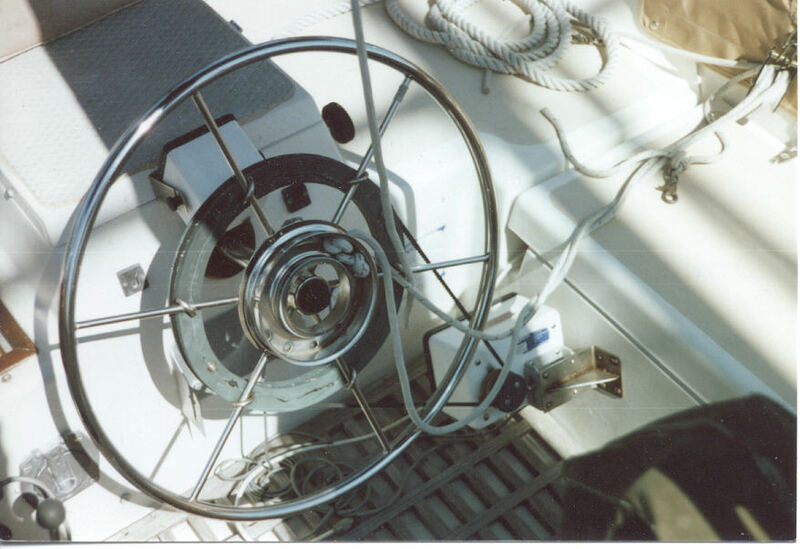 The Autohelm 4000+ installed in despair in Sao Miguel devoured belts, then disengaged, then broke on of the internal wheels, all as described by Jack, until I disengaged the hydraulic ram that was part of the Windhunter system. Raytheon replaced the wheel unit and motor after the wheel broke without fuss (I was just under the 2 year warranty), and I have had no problem since in the easy LI Sound. Now, I feel much more comfortable (and so do my batteries) putting on the windvane as soon as practical. The Raytheon ST 5000 is similarly mounted with epoxy and a mahogany support reaches an anchorage on the existing steering support structure. I know many of us have Autohelm ST4000 autopilots on our boats. The component that most often fails in these are the timing belts, which stretch a little and wear, till the units will not steer well. If you buy a replacement belt kit, the instructions say we should change belts every few hundred hours. I have found that one belt lasts about 7 days offshore, when steering 24 hours a day. Replacement belt kits are $55 from West Marine. Having bought too many of these I looked around for an alternative. We can get the same belt from Belt Corporation of America for $7.75 each! (Minimum order $25). I just got 4. Also, when replacing the belt, remove the half dozen black wheels inside of the unit and apply grease to the bronze bearings. If you don't, these bearings seize up and the mounts (plastic) break off. Be very careful to grease only the bearing; there must be no grease on the belt or the surfaces the belt runs against. I have two ST4000s, and found that these wheels are a problem. Last year I bolted the broken ones together using #8 bolts and lock nuts, which worked just fine. I recently ran bolts through all of the wheels just to be sure there's never a problem again. If you do this, please do not tighten the bolts too much; the wheels must spin freely. I am not quite at the stage of autopilots or wind vane installation, but I thought I would glean as much info. as I could ahead of time. Would be better to have a moderately powerful autopilot such as the ST4000 combined with a windvane to cover a variety of sheltered water and offshore uses, or to get a stronger (and more expensive) autopilot that uses a mechanical or hydraulic actuator under the deck? From most information that I have so far collated, it appears the satisfaction of the reporting owners regarding the ST 4000 is marginal at best. The ST 5000 is a linear drive and is the only, "so-called" linear drive 'package' rated for vessels up to 20,000 pounds displacement. The cost of the unit and the 10 inch Edson 1.5 inch bored bronze tiller are just under $2800.00 . The complete installation is not an easy job but can be owner installed. My Seawind came with an ST4000. The first season I sailed from Baltimore to Bermuda to Antigua, and the thing was barely working on arrival in Antigua. The problem was that the belt stretched and started to wear. A replacement ($55 at West or $7.50 from Belt Corp of America) fixed the problem. At that time I elected to buy a spare ST4000 as I hate to steer. The two units, plus plenty of spare belts, were adequate but a constant headache. The little black engagement lever gets out of adjustment, and cannot be re-adjusted by mere mortals. So you wind up using shock cord to keep it from dis-engaging. The wheels inside of the steering ring break off - I wound up bolting them in position, which was very satisfactory. The brain and the compass units have never given a moment's trouble in about 10,000 offshore miles over the last 2.5 years. The unit really can't handle the Seawind when she wants to fly. Above 6 knots the autopilot doesn't steer well. So this year Voyager got a wind vane, an old Sailomat I found at Ocean Outfitters in Annapolis for $250. It was in bad shape, with a seized main shaft and various other ailments. But repairable. A fun job, actually. So this summer we sailed 3000 offshore miles, singlehanded. When there's wind, the vane steers, and does a wonderful job. When there's no wind, we motor under ST4000. In the no-wind conditions, of course, the sea is pretty flat so steering is easy and the autopilot very happy. In the Chesapeake Bay the wind vane is usually not so great because the wind is rarely all that steady. The unit will follow the breeze, which is not what one always wants in confined waters. So I'm quite delighted with the current self steering arrangements, but two ST4000s starts to get near the cost of a single ST5000. Also, I have an old Autohelm 2000 I used on a couple of Atlantic crossings on my previous boat. It's a tiller drive. My plan is to use this as the ultimate back-up, and to connect it to control the wind vane itself: the actuator will drive the linkage where the vane connects to the rest of the gear. I've done this on a Monitor vane on a friend's boat (a 26,000 pound Tayana) and it works very well. There's also no load on the autopilot so it lasts forever. The hydraulic units can consume a LOT of power. Be careful. A good friend recently installed a Cetrek hydraulic unit and found it averages 6 amps! It does work very well, though, although when he transmits on his SSB the thing goes nuts. He has to have someone steering when he's chatting on the radio. However, he's trying to work that problem out now. Cetrek is modifying the software, and my friend is changing wiring around. Check into the CPT autopilot produced at Scanmar in California. We have had one for over 12 years and find it reliable, strongly built, and submersible. It is a blue water pilot with plenty of experience crossing oceans for years. Loathing the heavy load of the hydraulic autopilot (Robertson or Autohelm 5000), I have stayed with the 4000+ which requires good balancing, and has served well since I disconnected the hydraulics of the Windhunter (a Raytheon 5000 piston), but has limitations. The Cape Horn windvane I recently installed allows to put a simple Autohelm 1000 on the Cape Horn quadrant which bears very low efforts, and this solves the autoppilot problem elegantly with very low power input. Another reason to contemplate Cape Horn as your windvane, wery reasonable and effective. The Autohelm 1000 on the Cape Horn windvane works well with my friend's Swan 42, so should be very efective on our smaller Seawind. I looked into the CPT and got performance data which seem effectively stronger than Aurtohelm 4000, but it is somewhat harder to fit on our helm, I found. Don's genius for work on the boat should be tapped as to detail of installation before you make your move. But also look at the combination of Cape Horn Windvane and Autopilot 1000 which works wonders all around on us as well as much larger boats, at zero (windvane) to very low power input for autopiloting. The other is an autopilot. DAYBREAK came with an old Benmar with rotary drive which is a good installation except that the electronics are old and on the verge of collapse. I am looking at an Autohelm 3000 belt drive (which I think they are phasing out). 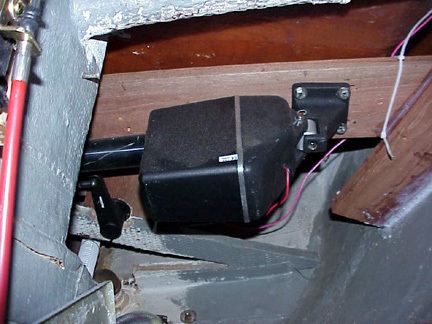 I have used it on other boats and it works fine but I would be interested in knowing what other owners have done - since the rack and pinion steering does not lend itself to the current crop of linear drive units. I could get an Autohelm with rotary drive for about $3500, which is out of the question. But Dan Goodspeed of Rye NY who bought a Swan 42 and upgraded it for making the same trip as I (around the Bermuda High to Africa and back via Carib. ), installed a Cape Horn along with the Autohelm 1000 on my suggestion, and has been testing the two this summer along the East Coast with great success he says, including in 40-50kts winds with 30-35ft seas. I would like to mention that I have used the same Autohelm cockpit mounted, belt-driven autopilot for about 21 years. The output transistors have been replaced once. It is quite satisfactory for all powering. It is never very good sailing upwind as it cannot compensate quickly for shifts that head (headers), resulting in the job going aback and often tacking the boat. I almost always use the steering vane going upwind. In the very light air upwind, I power. It cannot handle heavy air. On a run in heavy air there is so much yawing that the autopilot is constantly running, trying to catch up. On a reach in heavy air, the autopilot may be overpowered by weather helm, although dropping the mizzen helps. I feel certain the algorithms it uses have been improved since this one was purchased. It has coped with immersion from boarding seas. In combination with a satisfactory steering vane, it has been O.K. The cost and ease of mounting make it a useful autopilot. Replacement belts are still available. I have an Autohelm 4000+ which mounts directly on the wheel, with the motor held by a custom made stainless steel tripod bolted on the aft cockpit bulkhead. It is not as powerful as the 3000 (no longer manufactured) and much less cluttering than the 3000 large motor and belt. It thus needs good balancing, which means using any sail settings that will reduce weather helm in a ketch. I ate up belts for a while, but that settled down when I disconnected the old hydraulic ram of the dismal Windhunter. I have not changed it in 2 years, vs. a few weeks before. Autohelm changed the wheel-mounted module with no questions asked when an inside roller broke. One of us have replaced these rollers axles with thru-bolts. In summary, Autohelm 4000+ is not as powerful as we would like, but a convenient add-on for motoring or short term sailing in temperate waters. Like most autopilots, it welcomes a back up (see Jack Ganssle's wonderful website story of his crossing to England, he met a cruiser with 7 Autohelms!!!). That is why you should first look into the Cape Horn approach which can add, to its rugged but elegant and cost-efficient windvane, a simple power-sparing Autohelm 1000 or Simrad tiller autopilot working with the steering oar. Then, you may think of the Autohelm 4000 as a back up! I have two Autohelm 4000s and have sailed about 7000 offshore miles with just these for steering. The units work pretty well, though as Bert suggests you really have to balance the boat. I find that after about 1500 miles they need a rebuild, which is why I carry two now, plus a number of spare belts. I did thru-bolt the little mounts that hold 7 or 8 wheels on inside the units, as these tend to break. Jack: is it you who found a cheap source of A-4000+ belts? Could you, or the lucky forager, tell us the spec and source? Even though I no longer eat them up, it pays to have cheap spares. I already have a spare motor from my offshore cruise, which I have not used yet. 4000+ belts belts from West are $55 each. From Belt Corp of America, part number 9.5AT5-750 Urethane Steel, they are $7.75 each. I feel certain that my input regarding autopilots can only be addressed to certain limited areas here. The sail trim for our boats is certainly critical to their efficiency and reliability, no doubt. It is typically that the failure of most manufactures is to understate the capabilities of their units. Most use the LOA of the boat to certify the capability rating of the unit they sell. When outfitting our old Southern Cross 31 (Gilmer also) we fitted the newest, heavy duty Autohelm 3000 Tiller Pilot. In light to moderate air it performed admirably. In a quartering sea the sea pressure upon the big rudder exerted more damaging pressure to the unit than it was able to withstand. It was replaced once and rebuilt twice. The two units mentioned so far are the 3000 and the 4000. If with typical diligence to trim either of these may actually serve quite well in mostly nominal conditions for most of us. The belt issues for both are but a part of the problem when the unit itself has failed at the time you need it most. Even redundancy is no guarantee. Hurricane Dean caught us south of Bermuda in 1989 and the 3000 Tillerpilot lasted just long enough to get us settled into a hove-to position before it gave up forever. Although I have yet to use it, I have recently installed the Autohelm (now Raytheon) 5000ST linear drive aboard Sea Quill. The advantage I see most important to me is that I cannot see it at all. I can remove it from its lair within about one minute if needed. The rating for this unit is for up to 20,000 displacement. Most of us own the yacht that was conservatively rated for a 14,900# displacement upon launching over twenty years ago!. Most of us have raised the waterline significantly over the years as more gear has been installed and more comforts and supplies find their way aboard, not to mention a likely 1,000 #s of absorbed water. The original waterline on most SW's I have seen are nearly 3 inches above the faint scribe from the factory. Displacement for this boat generally can be characterized as about 3/4 inch for each 750 pounds of added displacement. The displacement numbers for a whole bunch of us must be accepted that we carry closer to 18,000+ #s. Most 32 footers cannot claim much more than 11,000 #s.
The beefy 5000ST and its design carefully mimics its bigger sisters and many have been aboard dozens of my deliveries and all have been nearly bulletproof. The 7000 aboard the 39,000 # Hans Christian I sail has been pressed hard now for 10 years and has not lost a beat yet. Even as I had once used a simple 1000 Tillerpilot attached to my (now shelved) Hydrovane, the swell pressure did have its way with the unit that drove the separate, dedicated, Hydrovane's steering rudder, aboard Sea Quill (then GiGi). Where reliability is expected in a unit, that is so often the extra crew aboard, I suggest that spending the money on the properly rated equipment cannot be argued in favor of anything less. With the Raytheon 5000ST, the Edson, bronze tiller arm and the professional mounting I have only about $3300.00 invested in a unit that is likely to stay together when that rising wind is trying to round her up or those big quartering seas are leaning upon that big barn door so many times during those long, tiring passages. The power requirement is just about the same. The one on the Hans Christian averages .85a per hour on a far bigger boat. With proper sail trim the unit works less, as we all know. It takes essentially the same power to do the job in any unit. We have been using the Cpt Auto pilot now for some 14 or so years. We have found it works very well under most sea conditions and we are still using the original belt. We do use our Monitor Wind steering vane when the winds are above 8 knots unless we are within a large amount of crab pots, then we use the Cpt electric pilot. This Cpt auto pilot unit has given us very satisfactory service and the unit is designed to operate under 30" of water continuously, so there is no worry about taking an occasional sea aboard or protecting it from rain storms. The unit was first developed by a small firm in Fort Lauderdale, FL, for blue water operation, and was originally chain driven, later a synthetic belt was developed and is obviously long lasting. About a year ago, the Cpt company was sold to Scanmar in California and is now available from them. Most of us own the yacht that was conservatively rated for a 14,900# displacement upon launching over twenty years ago!. Most of us have raised the waterline significantly over the years as more gear has been installed and more comforts and supplies find their way aboard, not to mention a likely 1,000 #s of absorbed water. The original waterline on most SW’s I have seen are nearly 3 inches above the faint scribe from the factory. Displacement for this boat generally can be characterized as about ¾ inch for each 750 pounds of added displacement. The displacement numbers for a whole bunch of us must be accepted that we carry closer to 18,000+ #s. Most 32 footers cannot claim much more than 11,000 #s.
Even as I had once used a simple 1000 Tillerpilot attached to my (now shelved) Hydrovane, the swell pressure did have its way with the unit that drove the separate, dedicated, Hydrovane’s steering rudder, aboard Sea Quill (then GiGi). I agree that 5000+ will do the job , but it hogs power, doesn’t it Paul? I have seen and read much to do with the various autopilots and windvane’s used and recommended by this group. My Seawind II came mounted with the Saye’s Rig. Shortly after acquiring her, I put her on the hard to accomplish various projects and upgrades I removed most of the windvane hardware and never really got to play with the windvane. Besides, being land locked (for the time being) its rather difficult to have time to set the course, set the windvane before its time to tack again. My question is, does anyone have any experience with the Saye’s Rig? Is it a viable windvane for offshore purposes? The previous owner did’nt have much to offer on this subject. I have sailed boats with this sort of pendulam control attached directly to the rudder. I prefer the Aries/Monitor type. Take a look at the testimonials and the website, it should operate as well as Monitors & Aries. I don’t know about the Cape Horn type, but I am sure you will get a response from the Seawind people who own one. They swear by them. But then I swear by our Aries also. I don’t know about Sayes’Rig, and hope Sharon’s website will help. You may even find a chat room on Sayes. The key is obviously to have a very quick set up. I Know only the Cape Horn (forget Windhunter! ): untie the steering oar and drop it in the water (3 sec, a bit longer to hoist it and tie, say 10 sec) place the vane in its lodgin, fit and secure the butterfly bolt that locks it (6 sec, 4sec to undo) orient it into apparent wind, while keeping boat and helm stable on the intended course (4-10s) pull the line loop that links the vane to the rudder quadrant and lock into the double grip (2 sec). 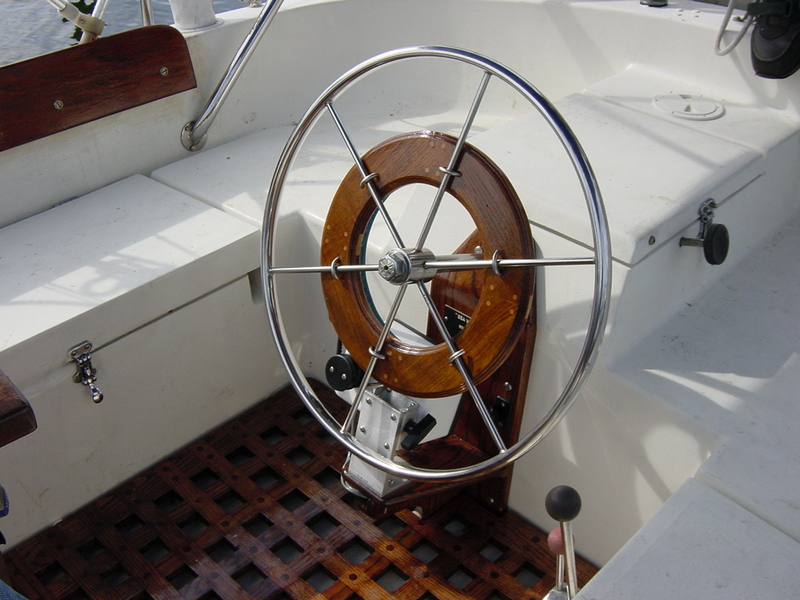 Tacking does not require disconnecting the quadrants’ loop, I only turn the vane by hand into its new position (symmetric of the previous one), and push the mizzen into the wind to ease the coming up and past irons. It is almost as fast as directly with the helm, and no disconnect! That is why I have now the Cape Horn active whenever there is 10kts apparent wind and 3kts of speed, and I have at least 10 or 15 minutes of straight course or clear tacking. It does change your life as solo (or as duo...), and eager crews can always disconnect if helm-happy. If you don’t have yet an Autopilot, the Cape Horn can serve buy adding a simple Autohelm 1000 or equ. Good luck with the Sayes. Once you get it to work, you may find ways to simplify/accelerate the connect/disconnect. Happy New Year! I’ve delivered three boats with Saye’s Rigs.... As the wind vane immediately converts wind direction directly to the ship’s rudder via the simple hardware, the size of the rudder is actually the measure of its efficiency.... I suspect on the SW II it is very likely a superb unit. Sorry, have no experience with this type of rig, but I would not count it out, suggest you wait until your in the water and then when the winds above 8 knots try it out. Yves is coming to Florida in a couple of weeks and wants me to give him a deposit so he can bring a Cape Horn along and install it on my boat. We are very tempted - after 30 years of sailing without a windvane. Bert, he sent me a picture of the installation on your boat and it does look good. I do not have that extra tiller arm but he says I don’t need it. The installation may be more difficult as I have propane lockers molded in on either side of my steering compartment. I don’t think it will prevent the installation, but it will be a challenge to get to to the attachment points on either side. Also, I am not planning on raising the mizzen boom and he says that will not be a problem - I just have to be a little more careful when changing tacks. He says there is no discount in effect as no other SWII owner has made a commitment at this point, but he says I will save his airfare as he is coming to Florida anyway so will not charge me his fare. So it sounds like the normal procedure is that you pay for him to fly to your boat and do the installation, is that right? This is a big expenditure for us so would appreciate any words of wisdom from the group. Would also appreciate any tips on incorporating the Autohelm 1000. 1. Yves G. charges normally his travelling expenses but, unlike US lawyers, he tries very hard to reduce them. He certainly did, both for a proposed installation in St.Martin FWI, and when he actually came down to Rye NY, by seeking best deals and combining trips. He stayed at our home to avoid hotel/living charges, and thus became a friend. His daily labor charge is one of the world’s best value, given his effective tooling, long hours (plus early start) and ardor at work. 3. Autohelm 1000: Any tiller autopilot incorporating its electronic compass will fit. I have not fitted mine yet, because it is not urgent since my 4000+ still works, but I will at some time. Yves checked for space and showed me how it could be done. Try to add the remote control option, I have not yet purchased that one, but I understand from my Swan42 friend that it helps if you can’t access quickly and clearly the buttons. I believe I can, so far, so will give it a try. Gave the Cape Horn its first test yesterday, in pretty challenging conditions, as we sailed along the Florida coast from Government Cut (Miami) to Lake Worth Inlet (West Palm Beach). The wind was south at 20 - 25 and seas were huge. We were almost dead downwind under 120% genoa (brand new) and mizzen and must have gotten an assist from the Gulf Stream as we were making about 8.5 K over the bottom. Didn’t think we were far enough out to be in the stream but we were moving. We fetched up a few miles off the inlet and made our jibe onto port tack a little late so wound up close hauled. Only then did we realize how strong the wind had been. Fortunately, we fetched the inlet without tacking. We are pleased and impressed as the Cape Horn handled all that down wind sailing with big seas at least as well as we could have done hand steering. How Wind Ketcher CPT attached.